Fortune spiked on a love triangle. Photo © Bill Cooper. Verdi’s Aida is often thought of as the most bombastic of grand operas, with the huge choruses, the majestic setting of Ancient Egypt and a menagerie of exotic animals. With its traditional reliance on visual spectacle, it is no wonder that it has been a staple of grand opera houses and dramatic open-air settings. David McVicar’s production (it premiered last year and this is the first revival) rejects any fussy artifice of faux-Egyptiana (there are no elephants, pyramids or sphinxes to be found here) and places the action in an anonymous, primitive society full of gruesome rituals, namely human sacrifice. The King of Egypt is a rather ineffectual figure; the real power lies with the merciless priests. The production is aurally magnificent in terms of individual performances and as a united whole, but the rather static direction and cautious acting (at odds with the production’s visceral visual style) make it less satisfying dramatically. At its core, Aida is a love triangle in which two women love the same man; one is the future ruler of Egypt and the other is an enslaved Ethiopian princess. The love of a man is forced to compete with the love of a country, personified as ‘Patria.’ Ultimately, it’s human love that triumphs, albeit with dire consequences. Jean-Marc Pusissant’s un-pretty, harshly lit designs resemble scaffolding, offering the strange juxtaposition of a pre-historic industrial society. This could possibly be to highlight the way in which everything has a price, while the costumes are a mixture of generic Ancient World styles. McVicar places great emphasis on the link between sexuality and death in this society. Amneris’s court resembles a harem full of insalubrious activities. During Ramades’s inauguration as leader of the army, bare breasted young women give their male sacrificial victims a final moment of pleasure before stabbing them repeatedly. These women appear again during the Triumphal March, which involves a rather gaudy hyper-macho gladiator-style dance to celebrate Egyptian victory in battle and takes place underneath a canopy of human corpses. In contrast to these displays of raw sexuality, the interaction between the three leads falls disappointingly flat. There is a tendency to sing out to the audience, rather than to develop the relationships on stage. In the title role, Ukrainian soprano Liudmyla Monastyrska in her Royal Opera House debut (she entered the production as a last minute replacement for a pregnant Micaela Carosi, which could help to explain the lack of chemistry between the romantic leads) offers a luminous vocal performance. Monastyrska’s finest dramatic moments are with her father, the deposed King of Ethiopia (a nuanced Carlos Almaguer), the undying love between her and Ramades (Carlo Ventre, in soaring voice) never taking flight. Likewise, Amneris’s rage feels closer to mild annoyance, but Olga Borodina’s rich tones and imperious presence provide a very fitting aura of majesty. 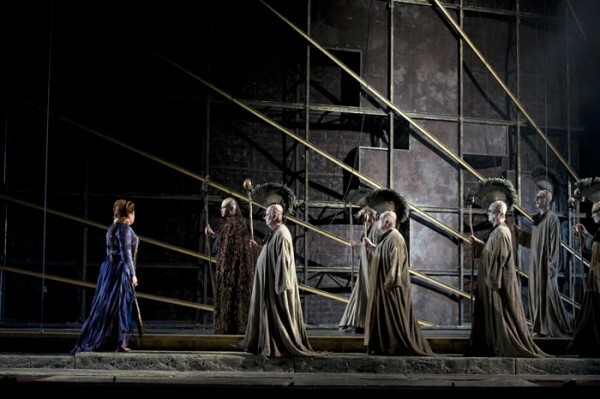 The enormous chorus look and sound formidable, but are under-directed and motionless during the crowd scenes – perhaps to reflect the single-mindedness of this culture, but there’s possibly also a sense of McVicar being unsure as to what to do with them. The concept of a non-glamorised Aida is an interesting one, which isn’t fully realised here with the old-fashioned staging. Nevertheless, the sound produced is remarkable and that kind of thrill is what’s ultimately most memorable. Cast includes Carlos Almaguer, Olga Borodina, Steven Ebel, Vitalij Kowaljow, Liudmyla Monastyrska, Madeleine Pierard, Brindley Sherratt, Carlo Ventre. Conductor: Fabio Luisi. (Note: casts vary).